AeroVironment's Stealthy, Persistent Perch and Stare UAVs got an additional $5.4 million in birdseed from DARPA. The intent is to develop the company's one-pound, 29-inch wingspan battery-powered Wasp unmanned system. The key technical challenges to be developed and integrated in the micro- air vehicle include: (1) multifunctional materials that integrate the SP2S airframe structure with the power supply and transmit/receive antennas; (2) advanced aerodynamics and control systems, including auto-land and auto-home functions; (3) perch-and-grip technology; (4) microminiature pan/tilt/zoom EO cameras; (5) autonomous image capture; and (6) data link communications relay capability with multiple digital channels that enables beyond-line-of-sight communications, with data/video encryption. As far as I know, the earliest mention of the idea of a miniature flying machine that can perch and stare is the Scarab Flying Insect Robot from the 1936 story by Raymond Z. Gallun. 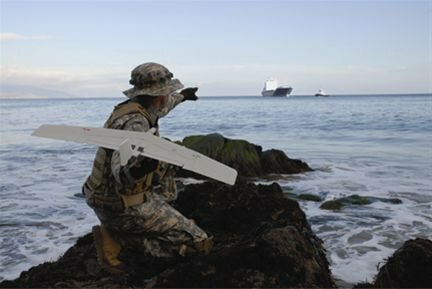 Take a look at another AeroVironment project - DARPA Vulture Five Year Flying Wing. See also this article on Perching Autonomous Aircraft Perfects Prop Hang. From DARPA and US shells out $10M for unmanned aircraft that can perch like a bird; via our friends at frolix_8.